The steel needles used in a gramophone (phonograph) are single-use only. The idea with shellac 78rpm records and the steel needle is that the needle wears and the record (almost) does not. This means that after one play the groove profile of a record is ground onto the needle. So the needle is worn after one play - if used on another record it would damage the groove. 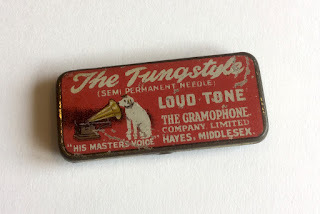 Gramophone needles were thus a consumable product. Even though obsolete today, steel gramophone needles are actually still being manufactured and sold new today. 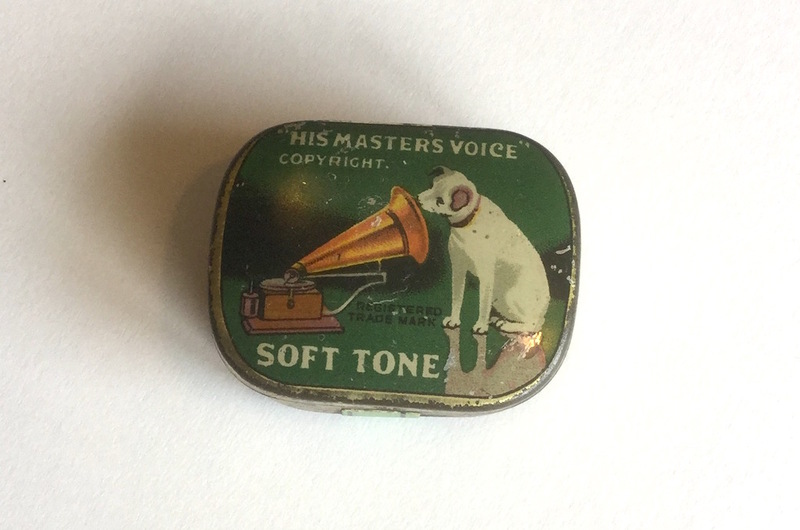 During the first half of the 20th century, these were widely sold in tins or packs of e.g. 200 pcs by many different companies and brands. The thickness of the needle controls the loudness of the music being played. 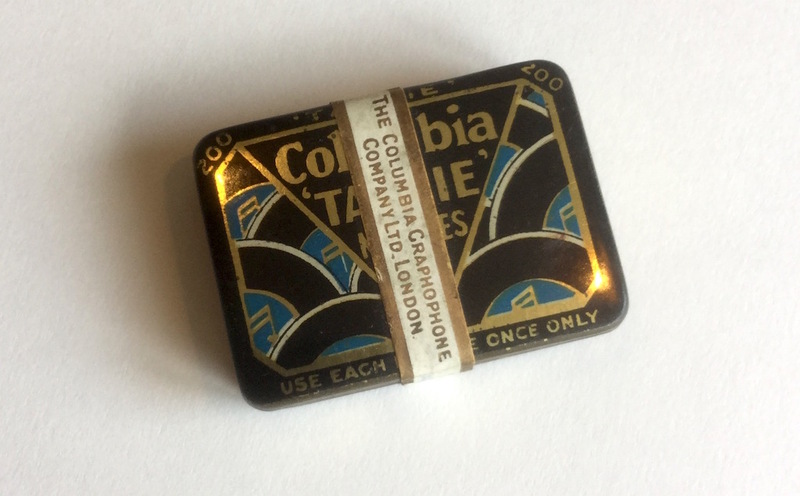 To ensure and show a tin contains unused needles, tins often have a paper wrapper or sleeve. 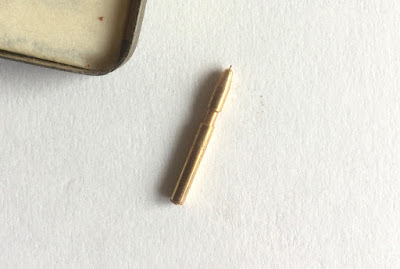 Most needle tins being offered online now as 'full' will most likely contain worn needles. 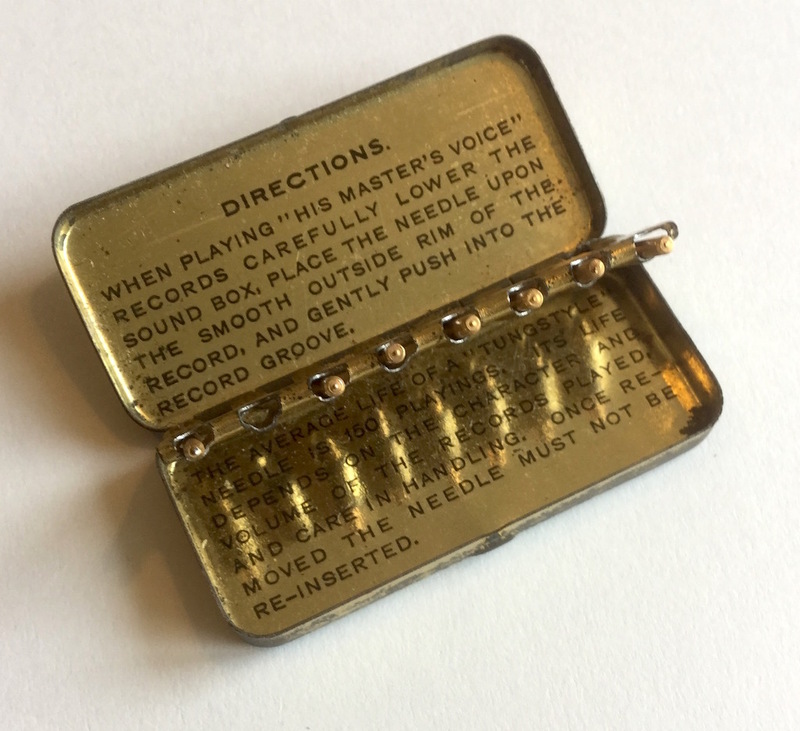 Needles would be put into the gramophone needle cup and the tin used to collect the worn needle after every play. 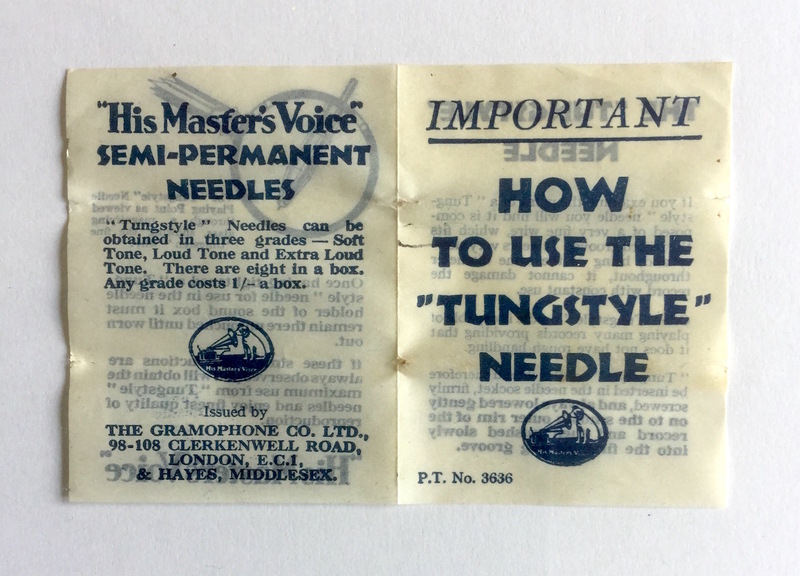 Inside the tin, a paper lining again cautions the user to use each needle only once! 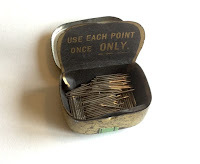 These were fairly costly, a shilling for a tin with eight needles. Every needle however promised to play about a hundred and fifty sides. The needles are held in a magazine hinged inside the tin. Additional to the instruction leaflet, directions are printed inside the tin. The needle consists of a stem like a conventional steel needle, but the tip is a thin length of tungsten wire. This wire does wear down eventually, but as it is a cylindrical wire it keeps the correct diameter to fit inside the groove. Because it is so thin, the differences in profile ground into the wire would be less damaging for the next record's groove. 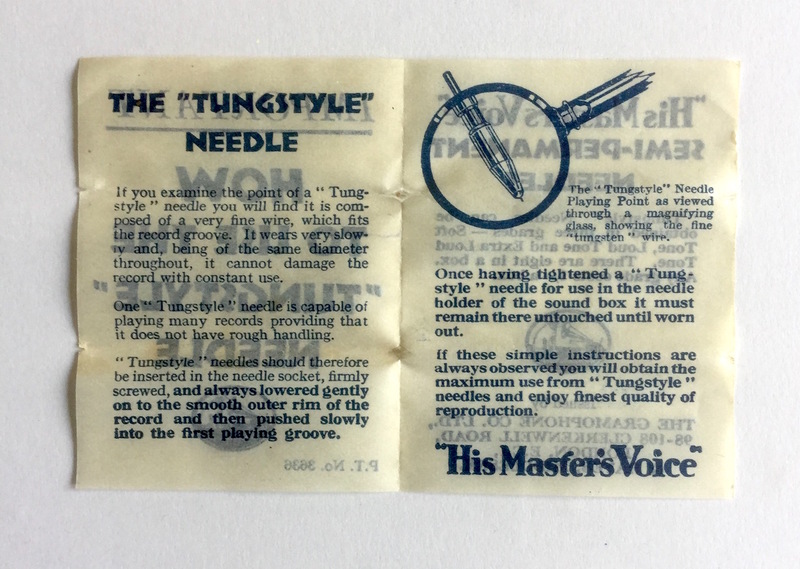 A difference with regular steel needles is that the Tungstyle plays from the bottom of the groove, instead of being guided by almost the entire groove wall. This is also where all the dirt and grit will collect of course. Records today will have been played and rarely be 'pristine' anymore. To make needles with varying loudness (volume), the stem is reduced in diameter. The loud needle has a very small reduction, a soft needle would have a much thinner 'waist' section. These remaining Tungstyle needles in the tin look unused, but can't quite be certain of course. 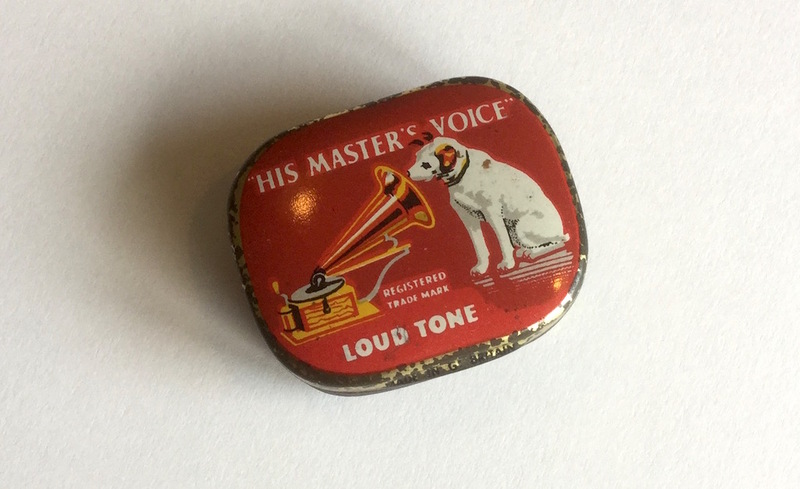 Even though tungsten wire is quite hard, the considerable weight of a soundbox and a gritty groove would likely wear down the wire quite quickly and/or do damage to the record groove. With a worn down tungsten wire, the thick stem then starts to run onto and in the record groove, again likely doing damage to the groove walls. 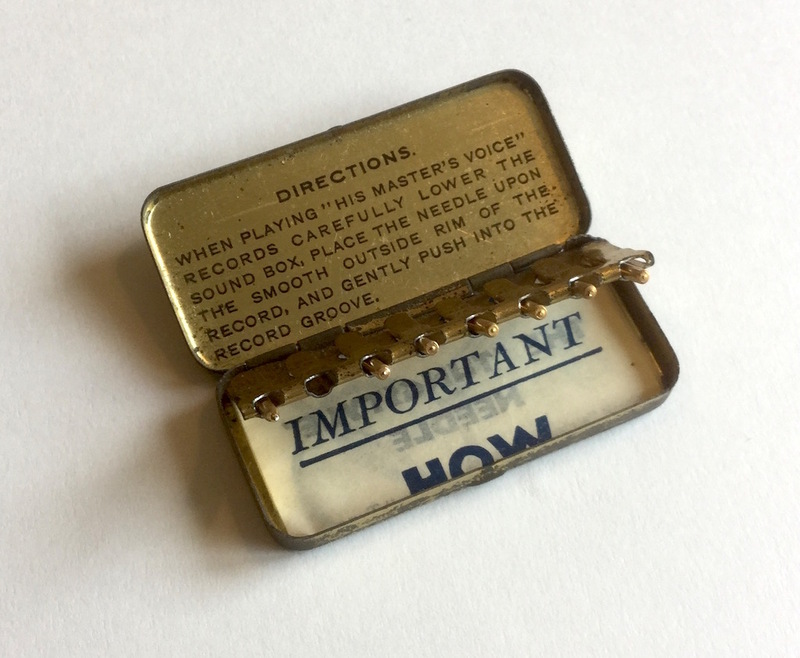 In short; these are interesting, but perhaps best not used on a worn shellac record today with an acoustic soundbox (or perhaps even back then). With a lighter electrical pick-up the use of one of these needles would be less risky. There are fans of these type of needle, the general remark does seem to be that it needs a very well adjusted soundbox with fresh gaskets that is light on the record. The supply is however limited. Unlike steel needles, the Tungstyle type of needle is no longer being manufactured (yet).